ATTENTION:: As of 3/16/19 I just sent #8 back to CGC to get a brand New Case with the signature series label AND the new Spider-Man graphic added to the CGC label!! Turn around time to get it back is approximately 6 weeks. UPDATE: As of 4/4/19, #8 is on its way back from CGC!!! ETA back to my house is 4/11. 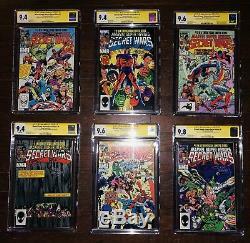 9 BOOK near 9.6 AVG LOT OF ALL CGC SIGNED HIGH GRADE BEST MARVEL LIMITED SERIES EVER 1984. Incredible story and a huge collectors item for all true Marvel fans! The best part the first 6 issues are Signed by all of the creators Including Jim Shooter, John Beatty and Michael Zeck!!!!!! That's 3 signatures per issue! 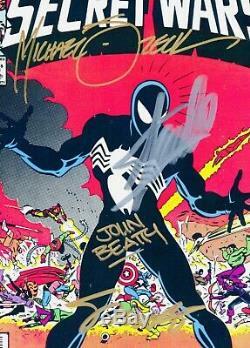 #9 has signatures by John Beatty, Michael Zeck and a signature AND Cyclops sketch by Bob McLeod! I mean before Identity Crisis, Infinite Crisis, House of M, Civil War, and Infinity Gauntlet there was Secret Wars. You really should own this significant piece of history for your self! FULL LIST IS AS FOLLOWS. 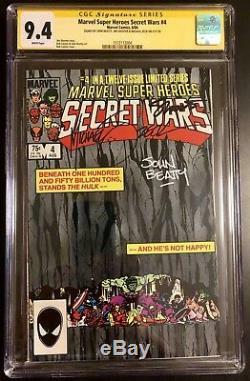 Secret Wars 1 - CGC 9.4 -- 3X Signed -- 1st appearance of Beyonder. 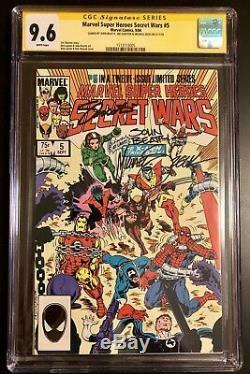 Secret Wars 2 - CGC 9.4 -- 3X Signed. 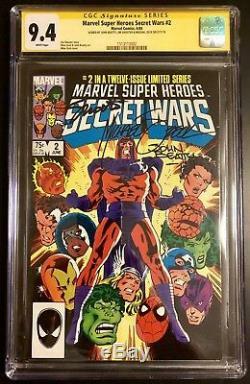 Secret Wars 3 - CGC 9.6 -- 3X Signed -- 1st appearances of Volcana (Marsha Rosenberg) and Titania (Mary MacPherran). 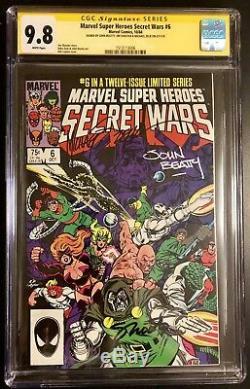 Secret Wars 4 - CGC 9.4 -- 3X Signed. 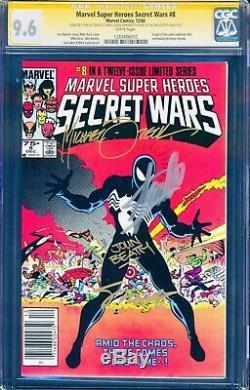 Secret Wars 5 - CGC 9.6 -- 3X Signed. 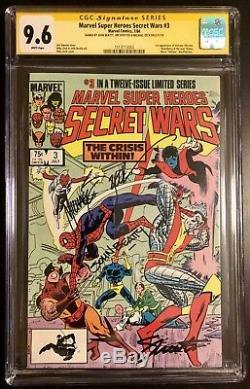 Secret Wars 6 - CGC 9.8 -- 3X Signed -- Cameo appearance of Spider-Woman II (Julia Carpenter) and the Death of Wasp (Janet Van Dyne). 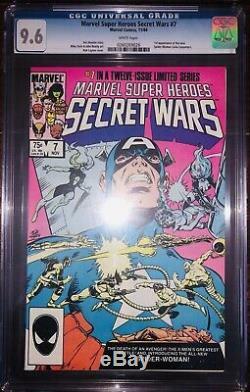 Secret Wars 7 - CGC 9.6 -- Unsigned (thrown in as a bonus) -- 1st full appearance of Spider-Woman II (Julia Carpenter). 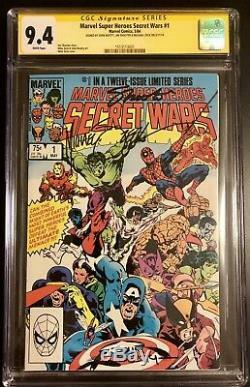 Secret Wars 8 - CGC 9.6 -- 4X Signed by STAN LEE + 3 More!!! ONLY 1 OF ITS KINDRARE NEWSSTAND EDITION - Origin of the Venom Symbiote. Spider-Man's new black costumed explained as alien costume. 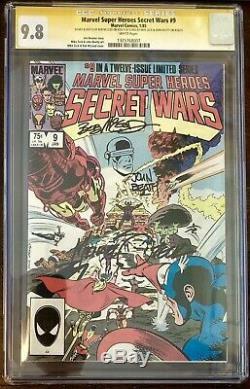 Secret Wars 9 - CGC 9.8 -- 3X Signed -- INCLUDES CYCLOPS SKETCH by BOB MCLEOD!!!! Please note that the CGC sleeves were only removed for a few minutes to take photos and were then promptly replaced. CONTACT ME WITH ANY QUESTIONS OR FOR MORE PICTURES.. 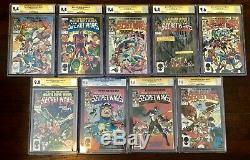 The item "SECRET WARS 1,2,3,4,5,6,7,8, &9! CGC LOT#8 SIGNED 4X BY STAN LEE! HOLY GRAIL" is in sale since Thursday, November 8, 2018. This item is in the category "Collectibles\Comics\Copper Age (1984-1991)\Superhero\Secret Wars". The seller is "mockgecko" and is located in Olympia, Washington.